These days, "please" and "thank you" still go a long way and few things drive the point home more than a little note handwritten with care. From "Thank you for the wedding gifts" to "Thank you for the interview," you'll definitely be remembered for it! And, of course, we always want to find the perfect card in which to send off our gratitude. Shoot, I remember spending hours at the store trying to find the perfect set to send after all my interviews! Stuffy, boring, run-of-the-mill cards? No thanks. Well I wish I'd known about Linda & Harriett way back then because I think her cards are so fun! 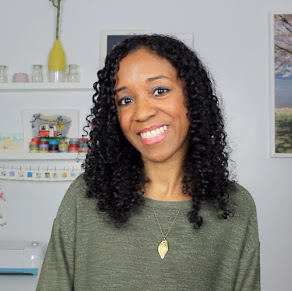 And I'm not just talking about her letterpressed note cards - her greeting cards are simply delicate with a touch of whimsy. This week, one of you will win a set of six Thank You note cards and envelopes in the design of your choosing: Scallop, Lace or Swirls. Just leave a comment below with your pick and a sure-to-be-thankful winner will be announced Thursday night! I agree...you can't go wrong with a Thank You! I love the lace. Very creative! I love the swirl design! I'd like to be put in the contest for the scallop ones, please. hard to choose between the scallop and swirls. I saw the lace and said YES! but then I saw the swirls and said ooooooo. I'd go with swirls. :) But these have NOTHING on the thank you note you got from me! THAT gold leafy stuff was AWESOME. I have more where it came from too...don't you fret. Oh I love these and could really use them because I have so many thank you cards to write! I really love the swirls or and the lace and would probably have to pick the lace. i want one. now please. Those are adorable!!! I love good manners and I love the swirls! oh, i think lace and i are meant to be. haha. i love all kinds of note cards, thanks for this giveaway! 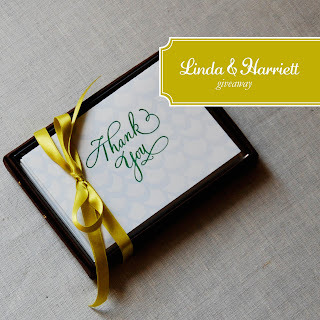 I've never heard of Linda & Harriett, but the Swirls thank you cards are just adorable!!! Very artsy! Oh! I cant decide!! I like both the scallops and the swirls. Either would be great. :) Surprise me if I win!